Gozo is an ideal family holiday destination! Gozo has some fantastic sandy beaches which are safe for swimming and great for relaxing with kids while enjoying the nice weather most time of the year. Moreover, while on holiday in Gozo, you will want to rest your mind that you and your family are travelling in a high standard vehicle equipped with all safety features necessary, especially when travelling with children. If you are travelling with children, Mayjo also provides different categories of baby or child seats. All vehicles are properly checked by our mechanic prior to rental. Once you arrive at the airport, you will find our driver waiting for you at the arrival lounge who will take you directly to your accommodation and show you the car and all its features. 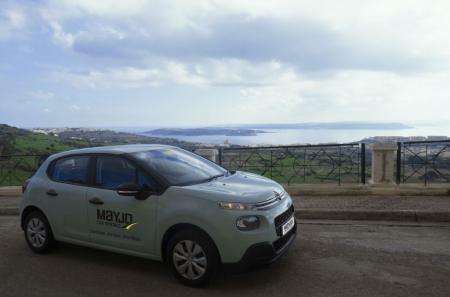 Car hire in Gozo cannot get any better! Frontal airbags and front and back seat belts. Customers applying for this offer will receive a discount code by email applicable during their visit. Contact us by email for more information. Flight details on arrival and departure, number of persons and dates of the car hire will be required.